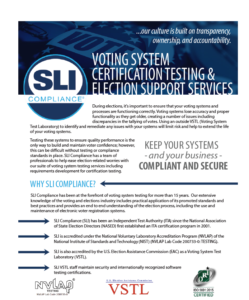 SLI Compliance® provides Voting System Testing and a full range of Election Support Services – from voting manufacturers to election jurisdictions – we're here to help you achieve your compliance goals. 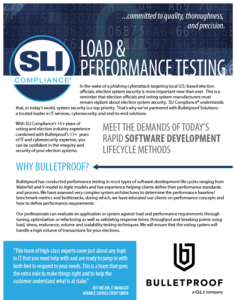 When it comes to Voting System Testing, SLI Compliance assures your test engagement receives the high-quality testing rigor required to meet today’s federal and state standards. Having been at the forefront of the voting system testing industry for more than 15 years, we provide an extensive knowledge of industry standards. SLI Compliance also understands that every election is important. That’s why you and your team take each election so seriously, you want to get it right. So how can you be sure your voting machines, systems, software and processes are functioning properly and securely? Fortunately, we’re here to help. 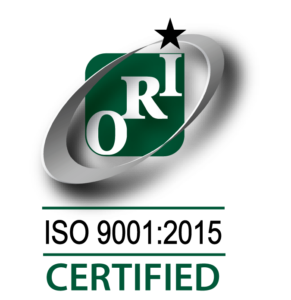 Our extensive knowledge of voting system industry standards, election processes and software security practices ensure quality performance to build and maintain voter confidence. 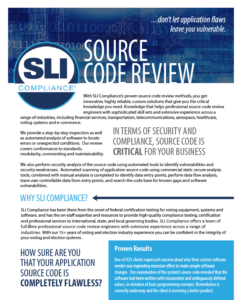 SLI Compliance has been an Independent Test Authority (ITA) since the National Association of State Election Directors (NASED) first established an ITA certification program in 2001. SLI Compliance is accredited under the National Voluntary Laboratory Accreditation Program (NVLAP) of the National Institute of Standards and Technology (NIST) (NVLAP Lab Code 00733-0: TESTING). 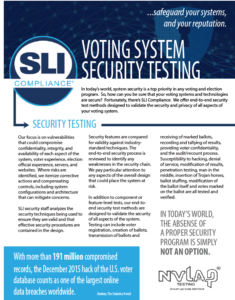 SLI Compliance is accredited by the U.S. Election Assistance Commission (EAC) as a Voting System Test Laboratory (VSTL). 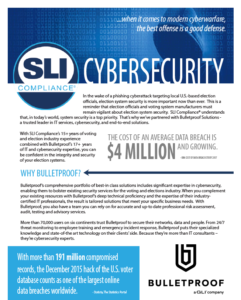 SLI VSTL staff maintain security and internationally recognized software testing certifications.